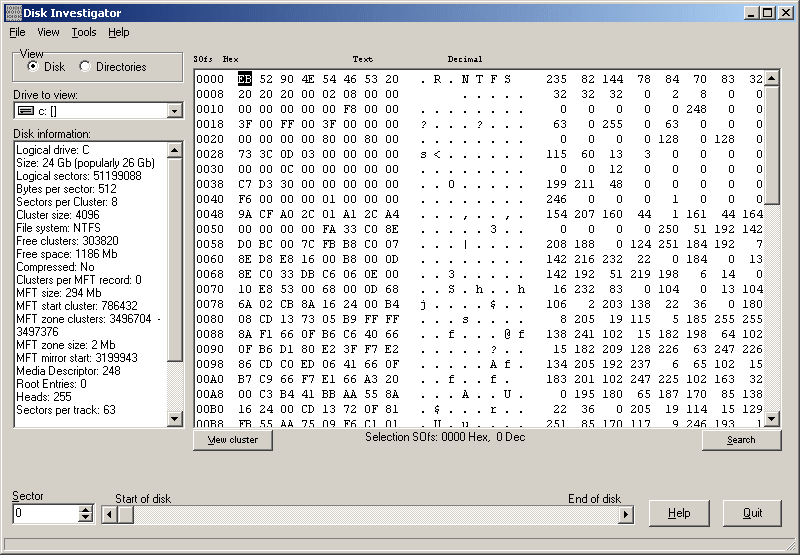 Disk Investigator displays the true drive contents by bypassing the operating system and directly reading the raw drive sectors. You can view and search raw directories, files, clusters, and system sectors, verify the effectiveness of file and disk wiping programs, and undelete previously deleted files. Writes settings to: Windows registry but given the nature of the application, I think it can be accepted as portable. NTFS Undelete is a straightforward tool that allows you to recover deleted files. It recovers files directly from hard drive, bypassing the Recycle Bin. How to extract: Download the ZIP package and extract to a folder of your choice. Launch NTFSUndelete.exe. Thanks for that, I am Baas. 'About' says it's NTFS Undelete 0.93. Undelete Plus is a quick and effective way to retrieve accidentally deleted files, files removed from the Recycle Bin, in a DOS window, from a network drive, from Windows Explorer with the SHIFT key held down. Since release 2.8 it can clean the disk (free space, cluster tips and directory entries). Note: Undelete Plus has gone payware. As such, I have made the version I have available for direct download. Please see comments for more download links contributed by donald. Writes settings to: Windows registry. Only one setting (Language) is saved and the default is English. How to extract: Download the single EXE (portable version) to a folder of your choice. Launch undelete_plus.exe. Of course these are minor nitpicks and do not decimate the value of the application. If recovering your files are a life and death situation than this should be the last thing on your mind. DO NOT USE - Total waste of $40 - customer service offensive after I could not get their program to work. I kid you not! Honestly, when you accidentally delete something important off from your memory card or hard drive, the best solution to take them all back is to copy them back from your prepare drive or card data backups. Therefore, making data backups is really important. But, if you also unfortunately forget to save data backups on other places, data recovery software is really workable when the previous data is not overwritten by anything new.